A description, how to take drift scan images, specially with my software, WinScan and ViewScan. Example: Focal length 750 mm, pixel height 9 um, declination 20 degree= 0,175122 seconds to read out a line. If you are using for example a ST-7 and a photo lens with 50mm FL (focal length) you will get an effective exposure time of 1258 sec. (The time, the star needs to move across the CCD.) Because of that long exposure time the CCD will become saturated. Even if you stop down the lens, or if you use filters, there may be problems as the orientation of the camera must be very exact, the focal length must be well known, the CCD must point to 0° declination, the image must not have distortions caused by the lens. You may get problems with trailing, the stars become trails or will look elongated. You may use the partial TDI mode to avoid that. You may use WinScan to take partial TDI images. Partial TDI images will be useful for example to search for variable stars. To search for asteroids you need a pixel scale of about < 2.5 arc sec (> 750 mm FL when using a ST-7). The files can be very big. The effective exposure time is calculated: number of the lines * the time to read out one line. Example : ST-7, 750 mm FL declination 20 degree , 0.175122 seconds to read out a line: 510 * 0.175122 = 89.3 sec. The effective exposure time is 89.3 seconds. The possible read out speed is in most cases height enough. Example: ST-7, a Pentium II computer at 233 MHz , shortest possible shiftime 0.027 sec, possible FL up to 4166 mm. The ST-8 needs about twice the time to read a line, so you can use a telescope up to about 2000 mm focal length. A faster computer will decrease the shortest possible shiftime a little. The new cameras with USB interface will be also faster. Make some tests, if you want to use a long FL. With long focal length the effective exposure time decreases. The field of view also decreases. The array disks caused by seeing will become bigger. So a shorter focal length should be preferred (fast scope). (To search for asteroids, the pixel size should be about 2.5 arc sec) I am using 750 mm. With long focal length you will get big files in a short time. For example: . ST-7, 750 mm FL about 33 MB in one hour, with 2000 mm FL about 89 MB in one hour. With binning the resolution can be decreased, the field of view is smaller as it is using a shorter focal length and no binning. The orientation of the camera is very important! The picture of the star moves parallel to the columns. Using CCDOPS form SBIG a star moves , comparing one image with the next , form the bottom of the screen to the top. I am using a telescope, 6 inch newton, 751 mm focal length, Vixen, GP mount. First I look for the polar alignment. The telescope should be put outside some time before using it, because the focus will change, when the temperature is changing (The focal length may change also). Then the CCD camera will be attached. I am using a ST-7 from SBIG , 510x765 Pixel, 9 um (micrometer) pixel. I added a self build attachment, so the orientation of the camera can be adjusted by a screw. CCD-Camera Then I focus the camera using CCDOPS. (peak value method) (WinScan has a fast focus feature, see the help file) I build a micrometer screw at my telescope to adjust the exact focus. Focusing without a mount will be a little more difficult. Then I control the orientation. 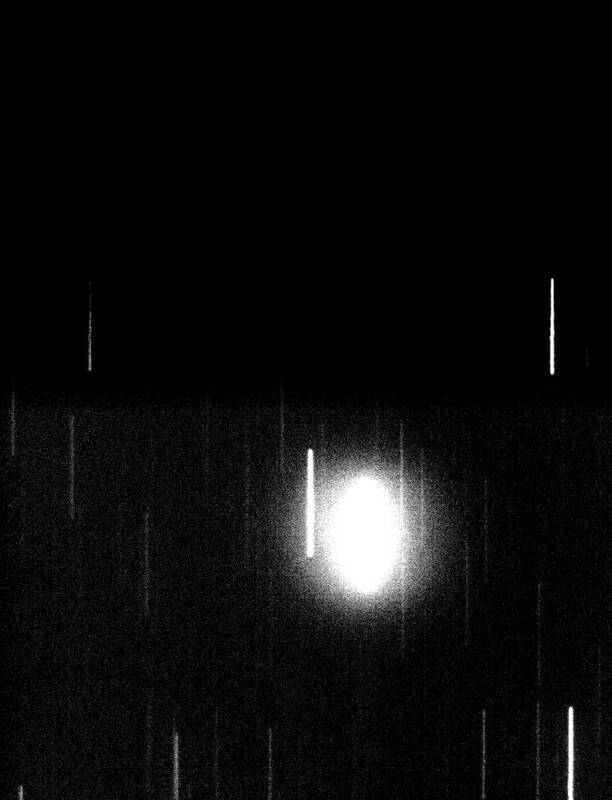 If the camera is in the right orientation, a star moves, at shut of telescope drive, form the bottom(east) to the top(west) of the image(screen) (using CCDOPS). To adjust the orientation exact, I take an image with trails of the stars using CCDOPS (Turn off the clock drive of the telescope). I am using an exposure time, a little shorter than the time a star needs to move from the bottom to the top of the image, so the ends of the trails are visible. (about 60 sec) A trail of a star should be exact at one column. That can be checked, using the X-Hairs of CCDOPS. Trails. If necessary I rotate the camera carefully. You should build an attachment that enables you to rotate the camera. The error in the orientation must be less then 0.11 degree. (ST-7). Then I start WinScan. At "Settings" there have to be made some entries for declination, focal length and others. Then the drift scan image can be started. It will be saved during the exposure. 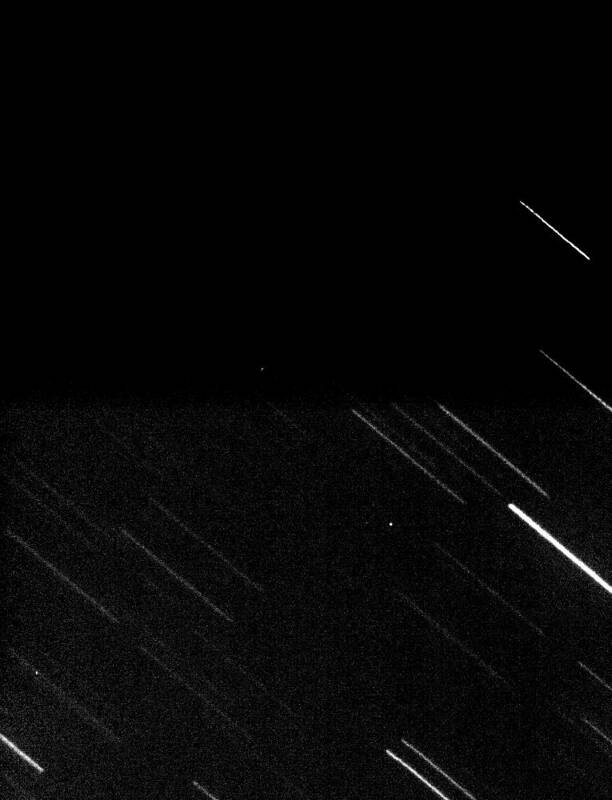 If asteroids should be found, about 0.5 h after the first images a second image can be taken (and 0.5 h later a third (and if you want, a fourth and fifth) ) of the same array. WinScan or SCAN are showing a control image while the image is taken. Other programs may be used to compare the images. You can also try ViewScan to view, evaluate and slice the images. I would recommend to slice the images using ViewScan, and evaluate the slices using an other program. Depending from the size of the CCD, the focal length and the declination (the field of view and the declination) differential trailing will appear. At the equatorial of the sky, the stars move by the rotation of the earth with about 15 arc seconds per second. Near the pole the speed is much lower. In an image north of the equatorial, the stars in the northern part of the image move slower than the stars in the middle, the stars in the south move faster. This will course a differential trailing in west- east direction. If it is calculated exact, the trailing at the side of the CCD near the pole is a little higher than the trailing at the side near the celestial equator. Using short focal lengths, it should be used a technique reading with open shutter only a few lines in, and reading the rest of the lines with closed shutter (partial TDI). The differential trailing is lesser. Example: 50 mm focal length, ST-7, declination 30 degree, it will occur a 22 pixel differential trailing if all 510 lines are read in with opened shutter. If only 22 lines read in with open shutter, the differential trailing will be only (22/510)*22=0.94 pixels. The differential trailing should be < 1 pixel (2-3 pixel may not decrease the quality of the image very much) or at a long FL smaller then the FWHM. As the stars describe arcs near the pole, there is also a differential trailing in north - south direction. Control image in WinScan, image stored by WinScan and shown by ViewScan. The begin is at the west. The images can be rotated. Some of my images at this site are rotated, so that north is at the top and east is at the left, then the width of the image in most cases is bigger than the height. The orientation of most images is remarked. Vertical stripes:(West-East) example The read out speed (shiftime) is not correct, this is caused by a wrong declination or a wrong focal length. Fill in the correct focal length and declination at "Settings". The read out speed shout be more exact than 1/510 using a ST-7. It may be useful to take a "stare mode" image and calculate the FL using an astrometry program. The declination must be also known exact, use a known bright star to start. Or you can try to fill in a longer (or shorter) FL until the stars become point like. Slanted stripes in the hole image: example The read out speed and the orientation of the camera are not correct. Vertical curved stripes in the hole image: At a high declination the read out speed (shiftime) (declination or focal length) is not correct. Vertical (curved) stripes at both sides of the image It is taken a image at a high declination. See: differential trailing In most cases the stars at the sides of the image look only a little oval an the image is looking blurred. Focus: By changing of the temperature during the exposure, the focus can change. Then it should be focused again. Focusing during a drift scan exposure is difficult, better end the exposure and focus using CCDOPS and a "stare mode" image. Orientation of the camera: If the polar alignment is not exact, the field will rotate by turning the telescope. The orientation of camera has to be adjusted new. Alt Az mount I have not tested an Alt Az mount. You have to calculate the rotation of the field and adjust the orientation of the camera new for every new Alt Az position, which will be time consuming and difficult ( tolerance about +- 0.11 degree (ST-7),+- 0.056 degree (ST-8)).Using a Alt Az mount as a meridian telescope the orientation of the camera will not change. Focusing the camera will be more difficult. Maybe it can be used a Hartman mask. Or it can be focused on the diffraction spikes. Focusers at dobsons may be difficult to use for CCD imaging. Balancing the scope may be difficult. Adjusting the orientation and the focus the first time may be also difficult. Accuracy of the timer WinScan uses the clock cycle counter. Pentium (or compartible) is required. (See readme.txt if you want to use SCAN (DOS)). Moving the mouse while taking an image, or running a second program, which requires processor time, should be avoided. (Check the time stamp file, if there are problems). The frequency of the CPU is calculated at the program start of WinScan. There are problems, when using mobile computers with Intel SpeedStep processors. Better use a computer without a SpeedStep processor. I am not sure, if it is possible to solve this problem by disabling the speed step feature. Anyway, the frequency of the CPU should be calculated at every program start of WinScan, as it may change. If you need an exact time in the file info (for example to measure positions of minor planets), it is recommend to set the system timer by an internet time server (or an other time source like GPS) every hour. The intern timer of WinScan has to be set to the system timer after that. The intern timer of WinScan can be calibrated, see the help file. Make some tests before starting observations. Evaluate the image: CCDOPS for Windows can show images up to about 15 MB. You should use ViewScan to view, evaluate and slice the images. Lccd= lines on the CCD in the current binning mode, S=shiftime. This formula is not valid for the ramping at the start (or end) of the image( For the ramping it is: E=L*S/2 ) The effective exposure time (E=Lccd*S) is stored in the file info at Exposure = 80.123 Using the effective exposure time and the shiftime, the number of lines of the CCD in the current binning can be calculated: Lccd=E/S To run SCAN >=1.6 under Windows, use the clock cycle counter (Pentium only) (Settings(33)). The orientation of the image is exact in declination, even if the orientation of the camera is not exact. If the orientation of the camera in not exact, there are >=3 reference stars necessary. If the orientation is exact, it will be needed only 2 reference stars.(theoretical). The kind of projection IMHO is a cylindrical projection, but if the orientation of the camera is not exact,IMHO the angle between Rae und Dec is not exact 90 º.
Precession: A drift scan image (fixed telescope), proceeds at a constant Dec related to the apparent position of the current epoch. The coordinates of the catalog files of the reference stars are related to J2000. Related to J2000 there will be a shift in Dec (a few arc sec.). This is caused by the precession (and nutation and aberration). So if you slice a large drift scan image to smaller files, the Dec (J2000) of the center of the slices will shift slightly from slice to slice. The orientation of the image may differ from 90 ° because of this. But there should be no problems, measuring slices in a moderate height (<1000 pixels). In very large images (some hours), the plate to sky function is also affected precession, nutation and aberration. 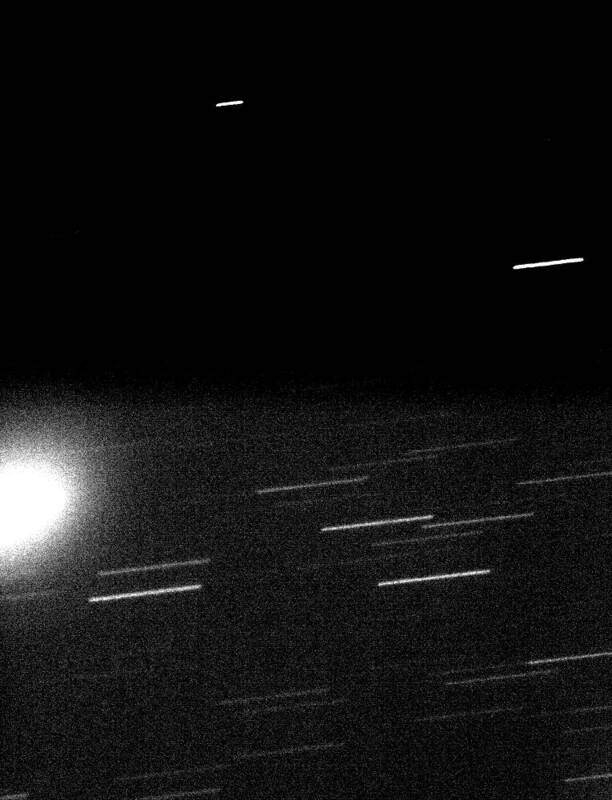 Evaluate the images: Common astrometry programs may not work with very big drift scan files. Use ViewScan to slice the files. You can also crop parts of the image using CCDOPS. You can also use JimsSlice , a program written by James Roe to slice drift scan images (SBIG file format only). (That program calculates the time of the begin of the sliced image new, regarding on the shiftime). I wrote a program to view, evaluate and slice drift scan images, you may test a preliminary version of ViewScan(Win 95,98,ME). You may use ViewScan to slice the images and evaluate the slices using other programs. The new version of Charon will accept drift scan images and also takes care at the shiftime /mid exposure time. See Settings in Charon for drift scan images . PinPoint also will accept the slices from ViewScan and correct the mid exposure time. (check the ViewScan help file:"Slice images for PinPoint") You can take 3 images of the same part of the sky, separated by about 0.5 hours. Open the images in ViewScan. Identify one reference star in every image. Add the images to the image list in ViewScan and slice them. The slices can be evaluated by PinPoint and asteroids or supernovae should be found automatically. It is recommend to use two computers, on to take the images, and a second to evaluate them. Calibrating images: Images can be calibrated on a per line basis using ViewScan. There are no hot pixels in drift scan images, hot pixels are smeared to hot columns. Darks and flats are one dimensional. IMHO calibrating images is not as important for drift scan images as it is for stare mode images. Errors in positions in RA and DEC probable caused by atmospheric fluctuations A preliminary test. Drift scan images should be sliced to slices with a moderate height. Others: If clouds pass during the exposure, the brightness of background will be different at different parts of the image. It may be also possible to use that technique to observe lunar occultation's and measure the stellar diameter by the diffraction pattern. It should be possible to use a technique, like that mentioned in observing occultation's, to observe flare stars. It can be also evaluated the size and frequency of the seeing with that technique. Using WinScan or SCAN to take speckle images: WinScan can be used to take speckle images. (of double stars or so) Principe: It is used the tracking CCD and the planetary mode. The shutter is opened, after about 0.03 sec there are read out about 10 lines very fast, the readouttime for one line is about 0.001 sec, this is repeated many times. You will get an image with many sub frames. There is some streaking visible, but the streaking can be removed. WinScan offers a "sub array image" feature. The height of the image in that mode is limited by the height of the CCD, but there is less smearing. Check the help file of WinScan for that. An astronomical CCD camera form the company SBIG ( SBIG ), a computer and a telescope or an objective. It may take some time to get familiar with drift scan imaging. Please tell me about your experiences. Also send me an e-mail, if you have any questions. Download: Software, to take drift scan images and to view them. Help file form WinScan, html online version. This side is still under construction.